Put simply, soil is quite possibly the single most important resource to human survival. Soil is front and centre to planet earth and everything living on and in it. We as humans are made from the elements of soil, and in it we find all the nutrition we require for human life, it’s where we grow and feed our food. Despite the vital link between us, our long term health and the health of soil around the earth, we humans haven’t always been the best at understanding how to keep soil healthy and what to do when it’s not. Our desires have often trumped our sense, and nowhere is this more true than in agriculture and the growing communities, engaged in a chase for yields at all costs. Others have with more elegance, outlined the dependence of humans on soil well being. Because soil is so critical to humanity, we have chosen to take some time to help new and old growers alike to better understand soil as a system. After thoughtfully reading through the piece, we guarantee you will better understand the soil you are using, have a deeper respect for its delicate balance, and have some new ideas on how you might squeeze extra value from your spaces, which will result in more nutrient dense food, and a richer local environment. Healthy soil not only helps us to grow awesome tasting, nutrient-rich foods, medicines, or nose filling flora scents, natural shade from the midday sun, and a myriad of other benefits, it is a fundamental regulator of the earth’s climate. Components in soils systems are the bookends of crucial biogeochemical cycles, which power all life on earth, ensure the mix of atmospheric gases, temperature and regulate losses which might otherwise result in a dramatic imbalance which may prove fatal to our biology. Indeed recent weather events are showing just how far we have already tipped the fine balance of planet earth via careless practice and neglect, and so today we offer hope in the fog. Every one of us, as growers, can take part in helping to restore earth’s natural balance, by really getting under the skin of the planet, and reinstating practice in our local environments to help counter the trend of extremes. Every day we are hearing stories of land loss, pollution, degrading nutrient levels in foods. All of these problems and more can be addressed by each one of us taking a bit more time to understand our own practices and impacts, and perhaps making some minor changes to entrenched methods, which are a result of misleading data supporting the sale of products we really don’t need. During this blog, we will take everyone right back to school, spending some time explaining in real terms, what soil is physically, and what the variations in its makeup mean to us growers specifically. It’s more than just some material we stand our plants up in and it’s certainly more than a chemistry shelf, in which we store our potions and lotions for our short-term gains. The soil surrounding our plants, is home, for our crops and ultimately for us and every organism we share this beautiful planet with. Today we are losing fertile soil at a rate that is simply unsustainable, and right now we’re losing the equivalent of 30 football pitches of fertile soil every minute. If we can learn from the get-go what soil health really means today, we can make the very best of this finite resource, and ensure its security for those that come long after us. Without healthy soil, plants just really struggle to grow. Since plants are a massive part of our lives as humans, it is in our interests as growers, to ensure what we do on the land, is always in sight of protecting this critical part of our home. To everyone looking to grow anything, soil or media is essentially made up of particles of organic and mineral material, in general, most soil is defined as any of that which is in part or a blend of sand, silt, clay, as well as, loam, rocks and pebbles and organic matter. When we stare at the ground, it really looks like an almost solid sheet of more or less equal color, when we get up close, we can begin to see that this mass is in fact made up of many different particle types, all differing sizes, many different colors and all sorts of textures. Soil in its most basic form is made up of mixed particles of Sand, Silt and Clays, but it’s also full of living organisms, these as big as arthropods and mammals, but as small as microscopic fungus and bacteria. Its this mash-up of various particles and living organisms that really power soil and enable us to squeeze so much life from such a thin layer of media. Many refer to the soil system, as a Living Soil Food Web, which is a really neat description, coined by organic soil scientists, such as Elaine Ingham some years ago. It works for me because it conjures up the image of a complex network beneath my feet, and this is the reality when we get up close and personal with soils. 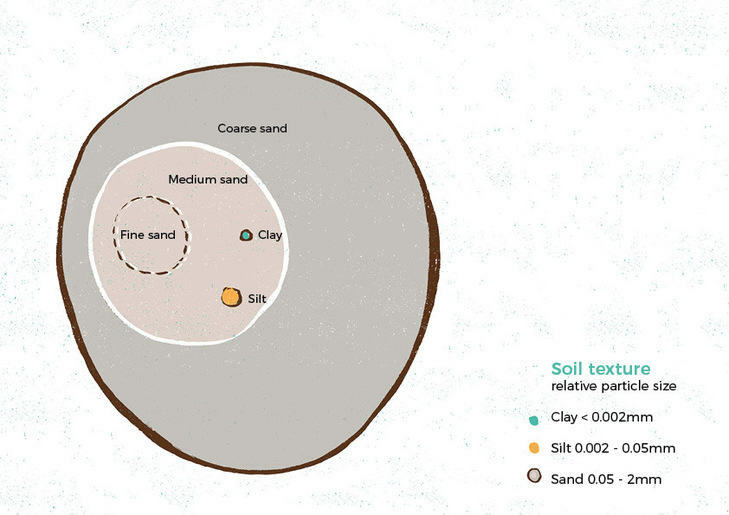 So we don’t get to carried away too quickly, let’s go back to the basic parts of soil, the sand, silt, and clays. Let’s take each of these major components and spend some time explaining what each is, giving reference to its quality and use in growing, rather than simply giving you the physical self of each. Once we have covered the bases, we will begin to take you deeper into the nature of soil, helping you understand how each base material, interacts with both plant and soil biology, sharing with you new groundbreaking research, which forms the basis of the Better Organix product range and plant, soil health system. We aim to debunk some of the common practices surrounding horticulture and introduce you to some mind-blowing findings that you can also use to guide your future growing choices. Growing plants is a massive subject area, and soil health could be considered a subject on its own. As we proceed with the blog here, we urge you the reader to get in touch with us, and let us now some of the concerns and interest areas you would like to learn and hear more about. We welcome your feedback and so please do reach out to our team if you feel we have missed something, or you seek further confirmation. In this blog post we will do our best to give you the basic skills and later introduce some available products that can help you all manage your growing spaces. Knowing the makeup of your soil in terms of base components will help you to better select both plant types and tools to assist your growing. One of the biggest causes of new growers failing to get success is the quality of media you are left to grow in, and or the plants chosen in this context. Any soil can be made good for any plant given enough time, but as growers, we want to get results from day one. If we can quickly pick up a few tips to help us reduce the loss of plant stock, then it’s a good idea to make time to understand the tips before we begin. Knowing what you want to plant, has to be preceded by what type of soil you have to use. 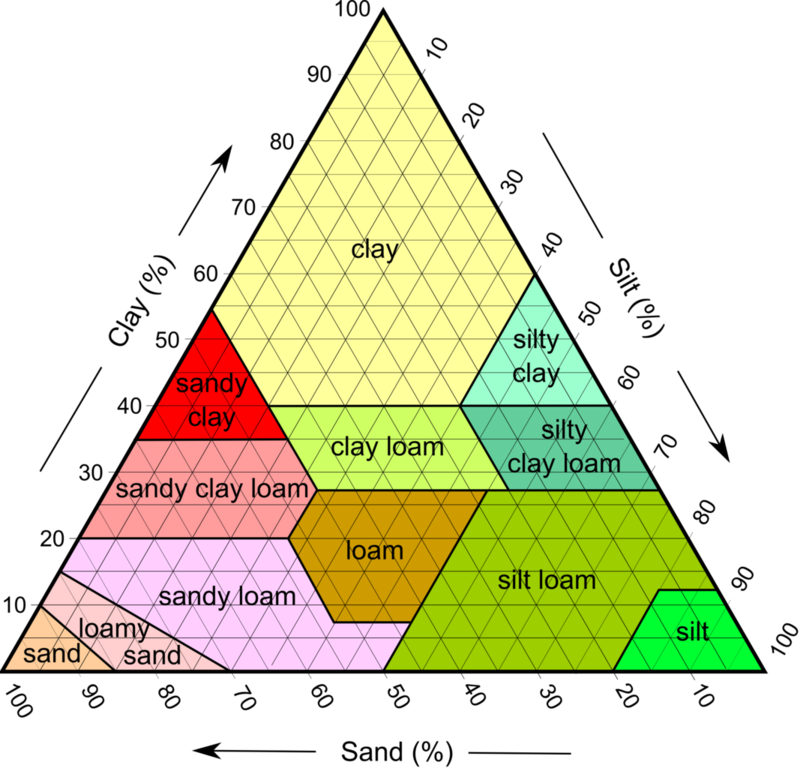 If you are faced with soil in your backyard, or elsewhere, there is a quick test you can do, and a chart, called a soil texture triangle, which you can print out from here to compare your results too. Obviously, the option exists to purchase soils from a store. More modern soils and potting mediums may contain Peat, Coco Fibres, Perlite and so on. We will take time at the end of the soil basics, to cover each of the common components of shop bought soils, since some of the properties are somewhat different and need to be highlighted. We hope this will help avoid incorrect purchases at soil or plant end when spending the hard earned cash. Important factors when choosing your own soils are in the soils ability to retain or drain water, capacity to hold oxygen, and the amount of minerals/salts that can be held readily available to our plants, in other words, its food. If you want to know how to perform a simple soil consistency test at home, give our simple soil test a go. But if you want to carry on, then jump right into the not-so-fine-grain mysteries of the first building block of soil, Sand.